January | 2017 | Whats Happening? The Homeless Point-in-Time Count is a one day, unduplicated count of sheltered and unsheltered homeless individuals and families in Forsyth County. The count, coordinated by United Way of Forsyth County and the Winston-Salem Forsyth County Homeless Council, helps determine the extent of homelessness in our community. The data collected is used to plan services for the homeless throughout the year. 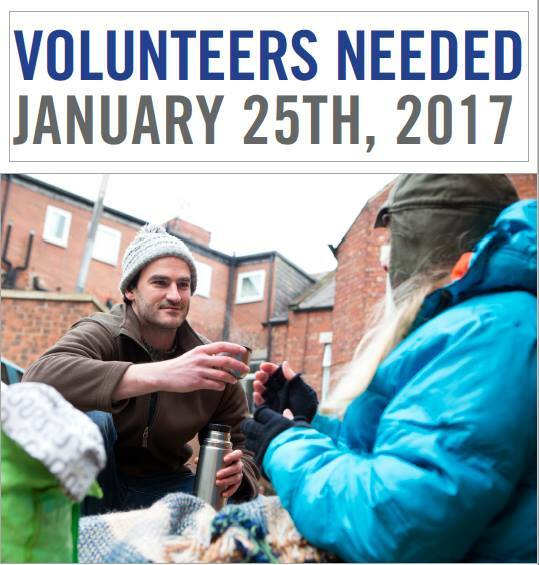 Volunteers are needed to help with the identification and counting of people who are sleeping outside on Wednesday, January 25, 2017 in Winston-Salem and the surrounding areas. Volunteers will be organized into groups of four or five and in two shifts, 9pm-12am and 1am-4am. Organizers will be assembling bags of necessities to hand out to homeless men and women and are seeking donations of winter hats, scarves, hand warmers, individual tissue packets, sun screen, bottled water, canned foods with pop-tops or pre-packaged food, and plastic utensils. For more information contact: Kathleen Wiener at Kathleen.Wiener@uwforsyth.org or 336.721.9378.